Our Double Rung Duke University Bar Stool stands 30″ tall with a 14″ seat surface. 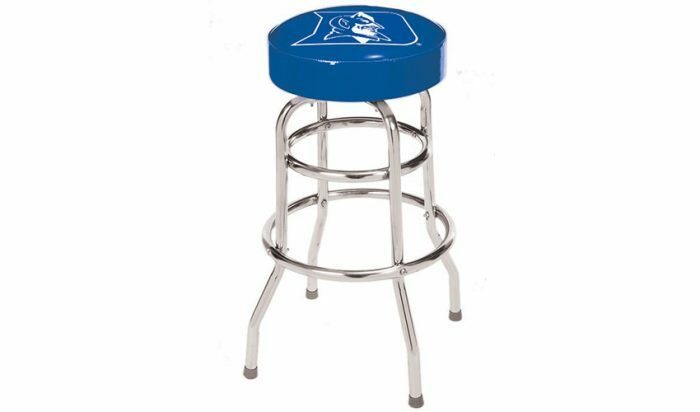 Base is made of 19-gauge chrome plated steel with a 2 x 4 reinforced seat that has a 360 degree swivel top. Logo and background color are screen-printed on the underside of clear commercial grade vinyl. With the reversed screen-print process, logo and background color will not peel, crack, or scratch off.